Na⁺/K⁺-ATPase (sodium-potassium adenosine triphosphatase, also known as the Na⁺/K⁺ pump or sodium–potassium pump) is an enzyme (an electrogenic transmembrane ATPase) found in the plasma membrane of all animal cells. It performs several functions in cell physiology. -ATPase enzyme is a solute pump that pumps potassium into cells while pumping sodium out of cells, both against their concentration gradients. This pumping is active (i.e. it uses energy from ATP). For every ATP molecule that the pump uses, three sodium ions are exported and two potassium ions are imported; there is hence a net export of a single positive charge per pump cycle. The sodium-potassium pump was discovered in 1957 by the Danish scientist Jens Christian Skou, who was awarded a Nobel Prize for his work in 1997. Its discovery marked an important step forward in the understanding of how ions get into and out of cells, and it has particular significance for excitable cells such as nerve cells, which depend on this pump to respond to stimuli and transmit impulses. An alternative theory, Ling’s adsorption theory, posits that the membrane potential and action potential of a living cell is due to the adsorption of mobile ions onto adsorption sites of cells. All mammals have four different sodium pump sub-types, or isoforms. Each has unique properties and tissue expression patterns. -ATPase can be responsible for up to 3/4 of the cell's energy expenditure. -ATPase, as well as effects of diffusion of the involved ions maintain the resting potential across the membranes. In order to maintain the cell membrane potential, cells keep a low concentration of sodium ions and high levels of potassium ions within the cell (intracellular). The sodium-potassium pump mechanism moves 3 sodium ions out and moves 2 potassium ions in, thus, in total, removing one positive charge carrier from the intracellular space (please see Mechanism for details). In addition, there is a short-circuit channel for potassium in the membrane, thus the voltage across the plasma membrane is close to the Nernst-potential of potassium. Export of sodium from the cell provides the driving force for several secondary active transporters membrane transport proteins, which import glucose, amino acids, and other nutrients into the cell by use of the sodium gradient. and glucose, which is far more efficient than simple diffusion. Similar processes are located in the renal tubular system. to which the pump is sensitive . Within the last decade[when? ], many independent labs have demonstrated that, in addition to the classical ion transporting, this membrane protein can also relay extracellular ouabain-binding signalling into the cell through regulation of protein tyrosine phosphorylation. The downstream signals through ouabain-triggered protein phosphorylation events include activation of the mitogen-activated protein kinase (MAPK) signal cascades, mitochondrial reactive oxygen species (ROS) production, as well as activation of phospholipase C (PLC) and inositol triphosphate (IP3) receptor (IP3R) in different intracellular compartments. pump also interacts with ankyrin, IP3R, PI3K, PLC-gamma and cofilin. pump on myelinated axons, in human brain, was demonstrated to be along the internodal axolemma, and not within the nodal axolemma as previously thought. The sodium-potassium pump is found in many cell (plasma) membranes. Powered by ATP, the pump moves sodium and potassium ions in opposite directions, each against its concentration gradient. In a single cycle of the pump, three sodium ions are extruded from and two potassium ions are imported into the cell. ATP is hydrolyzed, leading to phosphorylation of the pump at a highly conserved aspartate residue and subsequent release of ADP. ions, so they are released. ions are released. ATP binds, and the process starts again. -ATPase. 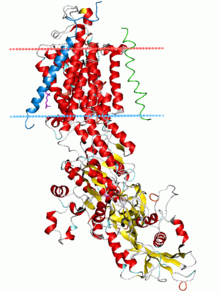 These include the ligands of the Gi-coupled GPCRs. Note: Early studies indicated the opposite effect, but these were later found to be inaccurate due to additional complicating factors. -ATPase can be pharmacologically modified by administrating drugs exogenously. -ATPase found in the membrane of heart cells is an important target of cardiac glycosides (for example digoxin and ouabain), inotropic drugs used to improve heart performance by increasing its force of contraction. is quickly returned to its normal concentration by a carrier enzyme in the plasma membrane, and a calcium pump in sarcoplasmic reticulum, causing the muscle to relax.
. However, apart from the population of Na/K-ATPase in the plasma membrane—responsible for ion transport --, there is another population in the caveolae which acts as digitalis receptor and stimulates the EGF-receptor. -ATPase was discovered by Jens Christian Skou in 1957 while working as assistant professor at the Department of Physiology, University of Aarhus, Denmark. He published his work that year. Alpha: ATP1A1, ATP1A2, ATP1A3, ATP1A4. #1 predominates in kidney. #2 is also known as "alpha(+)"
Mechanism of the sodium-potassium exchange pump. ^ Tamagawa H, Funatani M, Ikeda K (January 2016). "Ling's Adsorption Theory as a Mechanism of Membrane Potential Generation Observed in Both Living and Nonliving Systems". Membranes. 6 (1): 11. doi:10.3390/membranes6010011. PMC 4812417. PMID 26821050. ^ Clausen MV, Hilbers F, Poulsen H (June 2017). "The Structure and Function of the Na,K-ATPase Isoforms in Health and Disease". Frontiers in Physiology. 8: 371. doi:10.3389/fphys.2017.00371. PMC 5459889. PMID 28634454. ^ a b Hall JE, Guyton AC (2006). Textbook of medical physiology. St. Louis, Mo: Elsevier Saunders. ISBN 978-0-7216-0240-0. ^ Howarth C, Gleeson P, Attwell D (July 2012). "Updated energy budgets for neural computation in the neocortex and cerebellum". Journal of Cerebral Blood Flow and Metabolism. 32 (7): 1222–32. doi:10.1038/jcbfm.2012.35. PMC 3390818. PMID 22434069. ^ Armstrong CM (May 2003). "The Na/K pump, Cl ion, and osmotic stabilization of cells". PNAS. 100 (10): 6257–6262. doi:10.1073/pnas.0931278100. PMC 156359. PMID 12730376. ^ Yuan Z, Cai T, Tian J, Ivanov AV, Giovannucci DR, Xie Z (September 2005). "Na/K-ATPase tethers phospholipase C and IP3 receptor into a calcium-regulatory complex". Molecular Biology of the Cell. 16 (9): 4034–45. doi:10.1091/mbc.E05-04-0295. PMC 1196317. PMID 15975899. ^ Tian J, Cai T, Yuan Z, Wang H, Liu L, Haas M, Maksimova E, Huang XY, Xie ZJ (January 2006). "Binding of Src to Na+/K+-ATPase forms a functional signaling complex". Molecular Biology of the Cell. 17 (1): 317–26. doi:10.1091/mbc.E05-08-0735. PMC 1345669. PMID 16267270. ^ Li Z, Cai T, Tian J, Xie JX, Zhao X, Liu L, Shapiro JI, Xie Z (July 2009). "NaKtide, a Na/K-ATPase-derived peptide Src inhibitor, antagonizes ouabain-activated signal transduction in cultured cells". The Journal of Biological Chemistry. 284 (31): 21066–76. doi:10.1074/jbc.M109.013821. PMC 2742871. PMID 19506077. ^ Lee K, Jung J, Kim M, Guidotti G (January 2001). "Interaction of the alpha subunit of Na,K-ATPase with cofilin". The Biochemical Journal. 353 (Pt 2): 377–85. doi:10.1042/0264-6021:3530377. PMC 1221581. PMID 11139403. ^ Forrest MD, Wall MJ, Press DA, Feng J (December 2012). "The sodium-potassium pump controls the intrinsic firing of the cerebellar Purkinje neuron". PLOS One. 7 (12): e51169. doi:10.1371/journal.pone.0051169. PMC 3527461. PMID 23284664. ^ Zylbertal A, Kahan A, Ben-Shaul Y, Yarom Y, Wagner S (December 2015). "Prolonged Intracellular Na+ Dynamics Govern Electrical Activity in Accessory Olfactory Bulb Mitral Cells". PLoS Biology. 13 (12): e1002319. doi:10.1371/journal.pbio.1002319. PMC 4684409. PMID 26674618. ^ Zylbertal A, Yarom Y, Wagner S (2017). "The Slow Dynamics of Intracellular Sodium Concentration Increase the Time Window of Neuronal Integration: A Simulation Study". Frontiers in Computational Neuroscience. 11: 85. doi:10.3389/fncom.2017.00085. PMC 5609115. PMID 28970791. ^ Forrest MD (December 2014). "The sodium-potassium pump is an information processing element in brain computation". Frontiers in Physiology. 5 (472): 472. doi:10.3389/fphys.2014.00472. PMC 4274886. PMID 25566080. ^ Cannon SC (July 2004). "Paying the price at the pump: dystonia from mutations in a Na+/K+ -ATPase". Neuron. 43 (2): 153–4. doi:10.1016/j.neuron.2004.07.002. PMID 15260948. ^ Calderon DP, Fremont R, Kraenzlin F, Khodakhah K (March 2011). "The neural substrates of rapid-onset Dystonia-Parkinsonism". Nature Neuroscience. 14 (3): 357–65. doi:10.1038/nn.2753. PMC 3430603. PMID 21297628. ^ Forrest MD (April 2015). "Simulation of alcohol action upon a detailed Purkinje neuron model and a simpler surrogate model that runs >400 times faster". BMC Neuroscience. 16 (27): 27. doi:10.1186/s12868-015-0162-6. PMC 4417229. PMID 25928094. ^ Forrest M (4 April 2015). "The Neuroscience Reason We Fall Over When Drunk". Science 2.0. Retrieved 30 May 2018. ^ Young EA, Fowler CD, Kidd GJ, Chang A, Rudick R, Fisher E, Trapp BD (April 2008). "Imaging correlates of decreased axonal Na+/K+ ATPase in chronic multiple sclerosis lesions". Annals of Neurology. 63 (4): 428–35. doi:10.1002/ana.21381. PMID 18438950. ^ Burnier, Michel (2008). Sodium In Health And Disease. CRC Press. p. 15. ISBN 978-0-8493-3978-3. ^ Blaustein MP (May 1977). "Sodium ions, calcium ions, blood pressure regulation, and hypertension: a reassessment and a hypothesis". The American Journal of Physiology. 232 (5): C165–73. doi:10.1152/ajpcell.1977.232.5.C165. PMID 324293. ^ Schoner W, Scheiner-Bobis G (September 2008). "Role of endogenous cardiotonic steroids in sodium homeostasis". Nephrology, Dialysis, Transplantation : Official Publication of the European Dialysis and Transplant Association - European Renal Association. 23 (9): 2723–9. doi:10.1093/ndt/gfn325. PMID 18556748.
exchanger and TRPC proteins". Biochimica et Biophysica Acta. 1802 (12): 1219–29. doi:10.1016/j.bbadis.2010.02.011. PMC 2909369. PMID 20211726. ^ Fuerstenwerth H (2014). "On the differences between ouabain and digitalis glycosides". American Journal of Therapeutics. 21 (1): 35–42. doi:10.1097/MJT.0b013e318217a609. PMID 21642827. ^ Pavlovic D (2014). "The role of cardiotonic steroids in the pathogenesis of cardiomyopathy in chronic kidney disease". Nephron Clinical Practice. 128 (1–2): 11–21. doi:10.1159/000363301. PMID 25341357. ^ Skou JC (February 1957). "The influence of some cations on an adenosine triphosphatase from peripheral nerves". Biochimica et Biophysica Acta. 23 (2): 394–401. doi:10.1016/0006-3002(57)90343-8. PMID 13412736.